Inside the hall, at the top of the stage hangs a ten feet banner. It reads: Ye Jegnoch Mishit, (An Evening of Ethiopian Heroes). Poster-size photos of the hero, General Legesse, are placed on both sides of the banner. At the entrance, a very large poster is also placed on a tripod. The writing is in Gold on a black background: a tribute to and representative list of Ethiopian heroes who gave the ablest leadership to the former armed forces, those who died while heroically fighting, and all those heroes who fell in line of duty for Ethiopia and their honor in the eastern, southern, and northern fronts in the 70s and 80s. Among those listed, there are names of those members of the armed forces who are still alive. These are representative names from the Army, Air force, Navy, and the Police forces. Also at the front entrance area, members of the former armed forces and members of the organizing committee dressed in jet black suits, white shirts and a tie were greeting and sitting Ethiopians coming to attend the event. Ato Samson Kebede, Capt. Fikru Debebe and other members of the committee were displaying on a table all kinds of items prepared for the occasion. A special issue magazine prepared by members of the AMFEA that has Gen. Legesse’s colorful picture on its front cover and a book about Gen Legesse Teferra, entitled The Tiger of the Sky (Ye Ayer layie Nebir) were few of the publications and items for display and sale at the back of the hall near the entrance. At the front raw tables, the invited guest of honors of evening: Honorable Ambassador Imiru Zeleke, Honorable Ambassador Ayalew Mandefro, Col Brehanu Wubneh of the Airforce have taken their seat. While another one, Col. Tsegaye Yimer, a person who gave a distinguished service to the Ethiopian Ground Forces for several decades, was unable to make it due to illness. Other invited and distinguished guests who have taken their seats include: Brig. 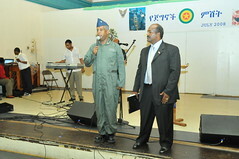 General Ashenafi Gebre Tsadik, an Air force pilot and another war hero on his own right; Brig. General Tsegaye Habtie Yimer, a prominent Air force officer who served in various high positions including as a commander of its Flight Training Academy; Ato Gebreyes Begna, a prominent businessman; Dr. Aklilu Habte, the former president of Addis Ababa University; Ato Mulugeta Lule, the prominent veteran journalist; Ato Solomon Kifle, distinguished veteran journalist now working for the VOA, Dr. Gebreye Wolde Rufael, a prominent physician known also for his contributions for democracy and Unity, Ato Abraha Belai, Editor-in-Chief of Ethiomedia, and many other distinguished guests have taken their seats. Around 9: 15 P.M, Gen. Legesse accompanied by his wife, two daughters, and other members of his family arrived. When General Legesse entered the Hall, three members of the former military in Army, Navy, and Air force uniform greeted the General with formal military salute with military marsh music at the background. Hundreds of those who were present stood up while members of the former military formed a straight line both at the right and left side of the hall way to give proper honor for the arriving hero. Gen Legesse Teffera, walking in front along his close friend Capt. Bezu and his family members were followed by the uniformed men before he took his sit at the special table reserved for him and members of his family. Artist Tamagne Beyene, the lead person of the stage for the event, formally announced the arrival of Gen. Legesse and Artist Shambel Belayneh took over to play a patriotic tune while the attendees sang, with ululation, rounds and rounds of applause to welcome the hero. Soon after dinner was served, Artist Tamagne Beyene invited Ato Hailu Balcha, a member of the organizing committee, who spoke briefly about purpose of the special event of the evening and gave background information how the committee was organized. The committee that consists of representatives from Association of the former Ethiopian Air force, The Harar Military Academy Alumni Association, The Ethiopian Ground Force Veterans Association, patriotic Ethiopians, and Artists, members of Gen. Legesse’s family managed to execute a special and colorful event to honor Gen. Legesse Teffera due to a team work that took more than four months of hard work, he told the audience. Ato Hailu expressed his appreciation to all members of the committee who worked very hard and the able leadership provided by Ato Brehanu Wolde Selassie, the chairman of the Association of the former Ethiopian Air force (AMFEA) and the chairman of the organizing committee of the special event, Ye Jegnoch Mishit. Then Ato Neamin Zeleke, a member of the organizing committee and program coordinator for the event, read brief biographies of the guests of honor for the evening and invited Birg Gen. Tsegaye Habtieh Yimer to the stage. Brig General Tsegaye is among those who served the former Ethiopian Former Ethiopain Airfoce in various capacities, including as commander of the Air Force Academy. He attended the Harar Military Academy seventh course for cadets with Gen Legesse Teffera and others. As a friend and colleague of Gen Legesse for more than four decades, Gen Tsegaye spoke at length his memories, far and near, about Gen Legesse, his contributions, the General’s heroic deeds, and his professional achievements . After Gen Tsegaye concluded his speech, Artist Tamagne Beyene announced the special gift presentation ceremony. Ato Yohannes Demissie and Ato Ayalneh Ejigou, members of the organizing committee carried the special gift and handed it to Col Berhanu Wubineh, one of the guests of honor and one of the ablest and distinguished members among pilots and members of the Air force. He was one of those who educated Birg General Legesse while he was a cadet. During the Ethio-Somali War of the '70s, Col Brehanu also contributed much as a pilot and commander of the F-5 E Interceptor squadron, a squadron that made tremendous contribution and sacrifice in defeating the Air force of the invading Somali forces. When Col Brehanu, accompanied by other the guests of honor and members of the organizing committee, presented the special gift to Gen Legesse , there was a another round of heavy applause, ululation, and emotional singing heard from among the large crowd of attendees. The special gift was a model F-5 E Fighter jet with the same serial number that was flown by Gen. Legesse to execute many of his heroic deeds during the war against the invading Somali forces and the very one shot down before he was taken as a prisoner of war (POW) in Somalia for eleven years. Artist Tamagne also announced that Dr. Assefa Negash who came from Holland has prepared a special gift to present it to Gen Legesse. Dr. Assefa gave a copy of O Minilik in frame, a newspaper named after Emperor Minilik and printed in Brazil by Black Brazilians who were struggling against racism and servitude to gain their freedom in Brazil several decades ago and the Sons of Sheba’s Race, a book by Prof Scot. He then made a brief remark how the African Diaspora or the black world in general back then looked up to Ethiopia for inspiration, and in this day and age where Ethiopia and Ethiopaiwinet have been under assault and negation from various forces, it is yet another testimony what and how much Ethiopia meant for the African people around the world, Dr. Assefa reminded those present. Ato Kebede Hale Mariam who came from Vancouver, Canada disturbed chest pins of the Ethiopian Flag to Gen Legesse, the guests of honor, and to the hundreds of Ethiopians present for the occasion. After receiving these gifts, Gen. Legesse made a brief speech tanking all Ethiopians who were present for giving recognition for his contribution as citizen of Ethiopia and discharging his duties as professional officer and pilot during the most trying times for Ethiopia and her people in the late 1970s. Moving poems conjuring the danger that was faced by Ethiopia back then and dedicated to Gen Legesse and other heroes were read by Maj. Kifle Abocher, the famous man of letters of the former ground force, and the renowned Artist Alemtsehay Wodajo. It was indeed a very sober and emotional moment for many who were present. Then Ambassador Ayalew Mandefro, one of the guests of honor, also spoke about the political and historical context of the Ethio-Somalia war of the seventies and shared his intimate knowledge of the events and incidents during that time in his former capacities as Ethiopia's Ambassador to Somali and a former Minister of Defense. He said that During the Ethio-Somali war of 1977, the performance of the Ethiopian Air force pilots from their F5E cockpit against the more advanced Mig 21 & 23's flown by the Somalis was just brilliant even if measured by the highest standard of an air to air battle. Indeed the heroic flight maneuvering skills displayed by pilots such as Brig. General Legesse Tefera and his colleagues epitomize succinctly the military adage – “what counts most in warfare is the human element behind the weapon and not the caliber of the weapon itself.” A second shinning and crucial performance the EAF recorded during the war was their execution in breaking the logistic line of the advancing enemy which saved the fall of Dire Dawa and perhaps beyond, Ambassador Ayalew reminded the audience. Dressed in Air Force flight uniform, Artist Tamagne Beyene took the stage again, announcing to an applauding and amused audience the following program of the event: a presentation of a special documentary produced for this special occasion. Tamagne pulled an amazing feat by taking many historical videos and a well researched narration to produce a documentary that lasted 30 minutes. The documentary film depicted the Somalia invasion of Ethiopia in the seventies and the heroic role played by the Ethiopian Air force. Among those mentioned in the film are General Legesse Teffera and other air force pilots, including Brig. General Ashenafi Gebere Tsadik, Col Brehanu, both were present at the occasion. Gen Ashenafi , another war hero present at the occasion, flew fighter jets side by side with Gen Legesse and many others, contributing much to reverse the grave danger posed to Ethiopia’s’ sovereignty and unity by the Somali invading force. When the jet fighter flown by Ethiopian pilots wee seen blowing the Somalia Mig jets to pieces, there were heavy applause from the over exited and emotional audience. There were moments were people were heard crying. This was yet one of the most emotional and memorable parts of the eventful evening. Upon the film’s conclusion, a deafening applause and cheer filled the hall, an expression of approval for work well done as a yet another tribute to Gen Legesse and other Ethiopian heroes by Artist Tamagne. Shambel Belayneh and other artists continued to stir the aroused patriotic feeling of the attendees by singing patriotic songs, shileela and fukera of the traditional war songs. At last, it was time to read short stories of representative and outstanding leaders of the former Ethiopian military and that of prominent heroes who fell heroically in line of duty in eastern and northern fronts as well as those among those who lost their lives during the failed coup attempt of 1989. Ato Neamin Zeleke asked the audience to stand up to honor and remember those who have died heroically and salute those who are still alive. Brief stories of those selected for the occasion- Brig General Teshome Tessema, at Massawa, Eritrea; Birg General Legesse Abeje, at Axum , Tigray front, Col. Mamo Temtime, at Nakfa, Eritrea, Col Belay Aschenaki at Masswa, Eritrea, Commodore Belege Belete and Commodore Getachew Siyoum of the Navy at Massawa, Eritera –were read. Also among the ablest military leaders of the modern armed forces that of Maj. General Fanta Belay of Air force, Maj. General Demissie Bultto of the Army, Maj. General Amha Desta of the Former Ethiopian Former Ethiopain Airfoce who died during the failed coup of 1989 were also read. The special event got coverage by Voice of America, German Radio, and Ethiopian Television Network (ETN), Ethiomedia.com (where Ethiomedia Chief Editor Abraha Belai was one of the Guests of Honor), Ato Muluneh Yohannes of Ethiomedia, Ato Aberra Wogi, Ato Abebe Antallew, Ato Tekelemickael Abebe, and reporting for of the Ethiopian Current Affairs Discussion Room, Ato Abebe Belew of Addis Voice , Videographers and photographers from Addis Culture, and other members of the media came to provide coverage for this special and historic event. The names of outstanding leaders and heroes, both alive and dead, from the former Army, Navy, Air force, and the police forces, representing unnamed thousands of other heroes from Generals to line officers, from NCOs and privates to militia members of the former armed forces were read. Note: The committee would like to apologize to Ethiopians who may have been offended due to unintended incidents that happened during the occasion.